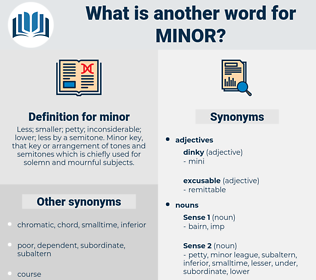 What is another word for minor? 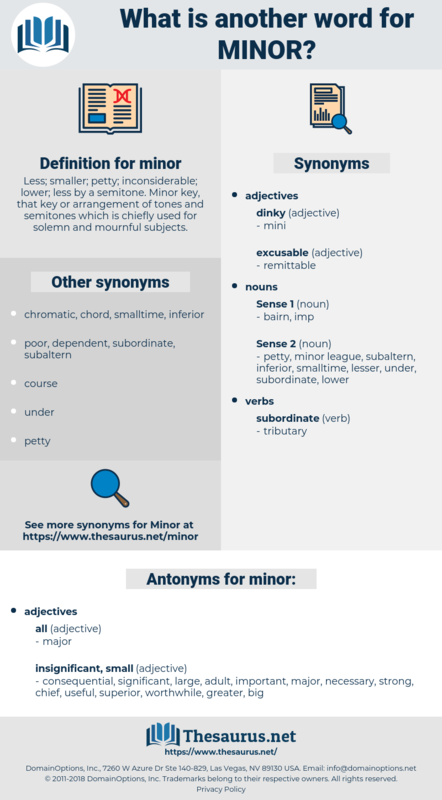 Less; smaller; petty; inconsiderable; lower; less by a semitone. Minor key, that key or arrangement of tones and semitones which is chiefly used for solemn and mournful subjects. insignificant, unimportant, Under-age, marginal, trivial, underaged, under-aged, minors, lesser. milder, negligible, inconsiderable, trifling, non-serious, inconsequential, less, minuscule, mini-soccer, inferior, youngest, immaterial, diminished, irrelevant, smaller-scale, lenient, lower-level, second-line, incidental, brief, narrow, juvenile, miniscule, faint, shorter, serious, subtle, low-level, light-commercial, light-weight, misdemeanour. incidents, Persons, Infants, limits, events, less, Les, juvenile, juveniles. big, adult, superior, greater, worthwhile, consequential, chief, large, useful, significant, important, necessary, strong. remarkable, famous, premium, material, more, high-grade, higher, eventful, outstanding, distinguished, impressive, unlimited, prestigious, renowned, worthy, overmastering, illustrious, fatal, valuable, distinctive, superordinate, fundamental, adequate, first class, meaningful, stellar, sufficient, senior, leading, all-important, select, choice, decisive, selected, prominent, first-rate, exceptional, better, prime, key, overbearing, acceptable, essential, dominant, principal, basic, prima, star, unpardonable, notorious, overriding, starring, limitless, primary, momentous, eminent, fateful, preeminent. Although the engagement was an extremely minor one, it being the first of its kind on the American sector, it was sufficient to give the enemy some idea of the determination and fighting qualities of the individual American soldier. What is thus true for this class of diseases can also be said of other minor affections. mare, marry, meiner, man hour, manor, mr, mummer, maori, moray, menhir, mwera, merry, mayor, menorrhea, Mary I, mimer, mimir, menorah, mammary, mire, moore, manure, mohair, meniere, moaner, mainer, myrrh, miro, memory, Mr., miry, moneyer, maar, miner, meir, muir, maria, mri, Mary Ii, maimer, murray, mari, monario, moirae, munro, miri, murrow, monroe, monomer, moon-ray, mayer, mineer, moon ray, mara, more, mere, morrow, marri, menurae, mohria, myanmar, minar, moire, marrow, menura, mar, mary, moor, monera, Moro, mummery, manner, memoir, moirai, mower, mirror, murre.